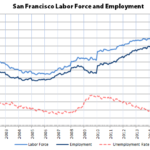 For the past 30 years, Center Hardware has been located in the warehouse building at 249 Pennsylvania/999 Mariposa, sitting on a parcel which abuts I-280 to the east and Pennsylvania Garden to the south at the base of Potrero Hill. Center Hardware’s lease is about to expire. And as we first reported in 2014, plans to redevelop the site have been drawn, the public hearing for which has been scheduled for next month (June 2). 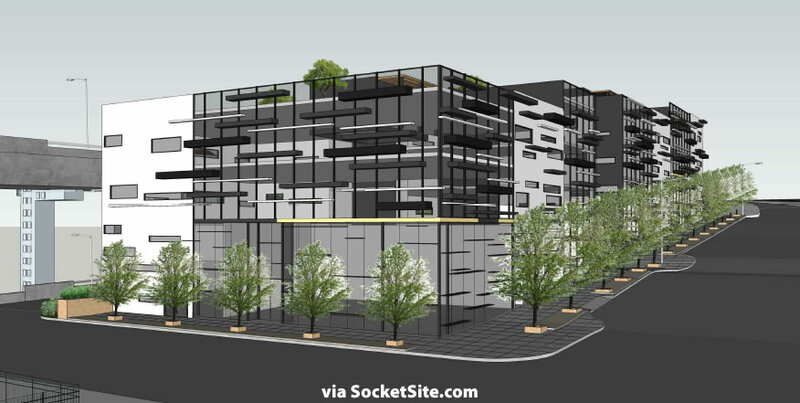 As designed D-Scheme Studio for the development team, a modern four-story building with 59 residential units over 3,400 square feet of PDR space and a basement garage for 44 cars will rise across the 249 Pennsylvania Street site. A planter based “green wall” will adorn the eastern side of the site, between I-280 and the building’s rear yard. And what is to become of Center Hardware? Well, the owners of 249 Pennsylvania parcel also own the industrial building at 3003 Third Street, which is currently occupied by an electrical supply company that is relocating to a larger facility. 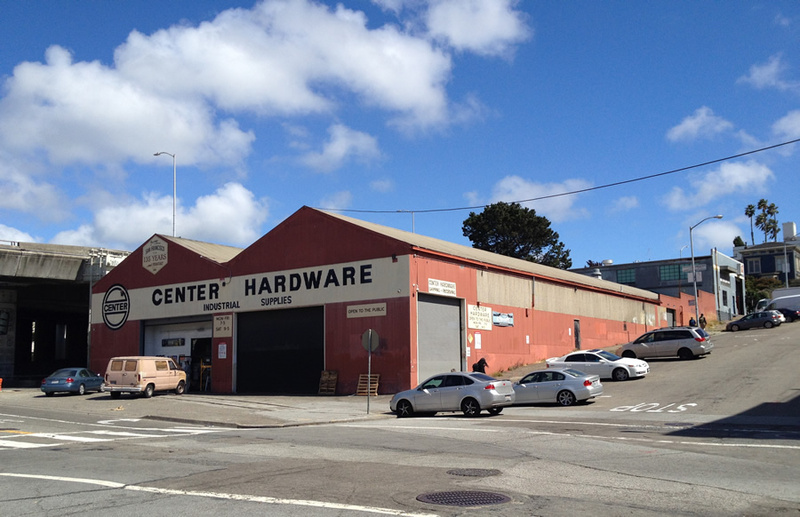 And based on a determination from the City’s Zoning Administrator mailed this month, a determination which was requested by the aforementioned owners of the two sites, Center Hardware would be a permitted use at 3003 Third Street in Dogpatch. Same rent ?? Same size ?? Same big parking lot…well, OK, we can skip that one. Take what you need, give what you can. I went by their new store today- no idea what their new rent is, but the space is at least as large as the old one, better lit, and has better parking. Glad to see they have (at least for now) survived the move. wow, this looks like something out of a first-year student in architecture school. looking at the architect’s website, they might be in over their head. that design makes absolutely no sense. I think a child trying to color within the lines could do a better job. even with the “green wall” next to the highway the backyard sitting area will most probably remain noisy and dirty. Despite the noise and dirty, people are crazy for that location. Just down the road from this location at 1001 17th street, 2 bd/2bd condos are going for +1m. With a proposal to remove 280 back to the Mariposa exit, and the strong possibility of years of construction in the future and work on the train tunnel also immediately adjacent, I don’t know that I would want to move in anytime soon. But just imagine how much more pleasant that corner will be when it’s the entrance/exit to a freeway!!! I find it amusing that the designer is expecting that many green plants in a courtyard that will get no more than about three hours of sunlight a year. There are many plants that thrive without direct sunlight. How many hours of sunlight does the living wall at the new SFMOMA get? That “design” is beyond atrocious. The problem is that too many architects put the form ahead of the function. They try to make something ‘artistic’ and ‘innovative’, but with little or no consideration for nuts-and-bolts practical concerns like cost, ongoing maintenance, and waterproofing. Things like green walls sound cool, sure, but they are immensely impractical. Curious about the generalized statement that green walls (living walls) are not just impractical but immensely impractical. The structural and maintenance aspects of living roofs are fairly standardized these days – living walls do present a maintenance challenge in that gravity is pushing the need to keep watering – and adding nutrients while watering can lead to something green and environmental – if not well managed – become an environmental hazard if phosphates are used repeatedly – which can lead to algae blooms downstream. Plant selection, is of course, a factor so as not to erode or weaken outer walls – and waterproofing must be done well as you’ve pointed out. 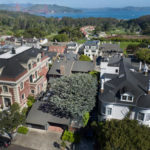 But living walls can provide sound buffering, and natural oxygen exchange in the atmosphere for cleaner and healthier air – which is a big deal for any one living within a few hundred feet of any freeway – since all those vehicles are putting out fine particles from brake linings as well as exhaust. If you consider that urban density brings both energy efficiency (that’s good for the environment) and urban “canyons” that interfere with natural air flows (not so good) any element that contributes to a bit more natural surroundings plus improved air quality might be – not just innovative or cool – but a welcome ant timely synergy of function & form. Who knows – maybe that is what they are building over at 1st and Mission. If they like the way it looks, they’ll go ahead and build the actual building . . . I think a balsa wood and construction paper full scale model would be cool. We could have our own local Burning Man when we’re done. But Aaron is right, Benioff should insist that the model use the actual final materials.